The Vanishing Year is my first book of 2017 and sometimes a mystery/thriller is just what this reader needs. 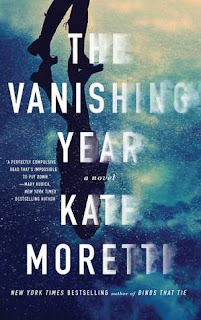 This is also my first book by Kate Moretti, I've seen her name floating around the internet the past few months and when The Vanishing Year became available in audio format at the library I jumped at the chance. It didn't take long to get drawn into this story, Zoe has a past, she wasn't always rich and living the high society life. Running from her past and trying to keep her secrets seem to finally have caught up with Zoe. There are many layers to this story and the author peels them back creating twists and turns I didn't see coming. As the story deepened the suspense built up putting me on a marathon read (listen). The Vanishing Year is a well written suspenseful, edge of you seat book, definitely an author I will read more of and recommend.